Raquel Welch Top Billing has a a Sheer Indulgence lace front with a monofilament top and 4 strategically placed pressure-sensitive clips for a secure fit. Top Billing by Raquel Welch is top of the line and customer favorite top piece/ topper. This clever hair addition is the perfect helper when added top-of-head volume is wanted. Tru2Life® heat-friendly synthetic hair allows you to seamlessly blend the piece with your own hair. Bangs are optional. This piece is ideal for a mid-length hair style and can be worn with long, layered styles as well. It can also be customized for shorter cuts. This unique top piece is one of the first to have a lace front! Also available in shades of gray. Watch Top Billing video and read customer top-piece reviews below! 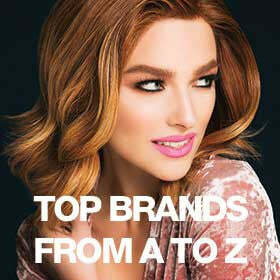 Tru2Life Heat-friendly Synthetic Hair Fiber - Looks and feels more like human hair and can be styled with heat tools. Sheer Indulgence Lace Front - Virtually invisible sheer lace front that gives you a natural looking hairline and amazing off-the-face styling versatility. Monofilament Top - Creates the illusion of natural hair growth where the hair is parted and allows you to part the hair in any direction. Base Dimension: 6.5" x 6.5"